I can’t think of a more romantic destination wedding location than Tuscany, Italy. Nicholas and I always knew we wanted an intimate wedding and our hearts were drawn to the most romantic destination in the world, Italy. When it finally was time for us to travel to Italy our hearts were a flutter. We were so overjoyed to be able to have this experience of a lifetime surrounded by sixteen of our closest friends and family for a 5 day wedding celebration! My heart overflows with love and gratitude for the warmth that surrounded us on our wedding day. We choose to stay at The Villa Le Cascine due to it being situated on top of the Tuscany rolling hills with a stunning backdrop of the Italian sky and Cyprus trees. The Villa provided the perfect location for our guests to spend the week and the wedding day close to our hearts. Each guest had their own private space decorated with a rustic Italian kitchen, gorgeous fireplace hearth and classic Italian decor. The Staff from Fattoria Santo Stefano who oversaw the Villa Le Cascine were the sweetest hosts during our stay and even assisted with the wedding day. We were so overjoyed that we picked a location that allowed us to have both the week accommodations and the wedding. 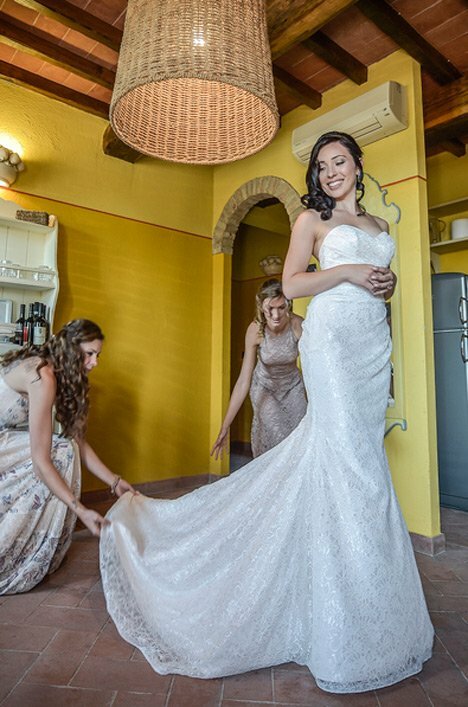 Simona Cotellini from Above and Beyond Weddings in Italy was a blessing, she worked with me from abroad for a year putting my thoughts and dreams into reality. When the wedding day began I was in awe at the detail and love that she put into every aspect of the wedding. The white roses surrounded by green Italian foliage mirrored the stunning landscape, and the soft candle light created the most romantic dinner setting. Most of all, she made sure that my primary concern was getting married and she perfectly executed a stress free day. It was important to us to have this day reflect the true beauty of Italy, we choose to only include Italian vendors who knew the true details of an Italian wedding. Our officiant was wonderful, Stefano Maccianti brought life to ceremony with beautiful quotes and laughter, which resonated with both Nicholas and I creating the most perfect moment. My makeup and hair was done by the very talented Mauro & Gianna from Armilla Beauty. A local violinist, Lorenzo Borneo, played a gorgeous rendition of “the rose” by Bette Milder and serenaded us with classic Italian songs. For the decor, Class Ricevimenti and Simona Cotellini arranged bouquets of white roses, offset by classic Italian fabrics draped over a gorgeous reclaimed wood table. Food and fine wines were served throughout the evening by the Class Ricevimenti catering company, true Italian cheeses and olives served with prosecco created a joyous cocktail hour, followed by an Italian feast of a lifetime. From drunk duck to aubergine pastas our guests spent an evening full of the best foods of Italy. One item which our guests our still raving about was the traditional Italian wedding cake provided by Class Ricevimenti. The soft fluffy pastry and strawberry toppings are a memory we may never forget. I will never forget how beautiful the day was standing at the top of the Italian Hills reciting our vows overlooking the gorgeous meadows to an evening of fine food and dancing, it was the perfect way to start our journey together. Our photographer was recommended to us by our wedding planner, Simona Cotellini. Andrea Pitti from Andrea Pitti Photography was unbelievable to work with. His style of photography captured the true unpoised moments of the day. 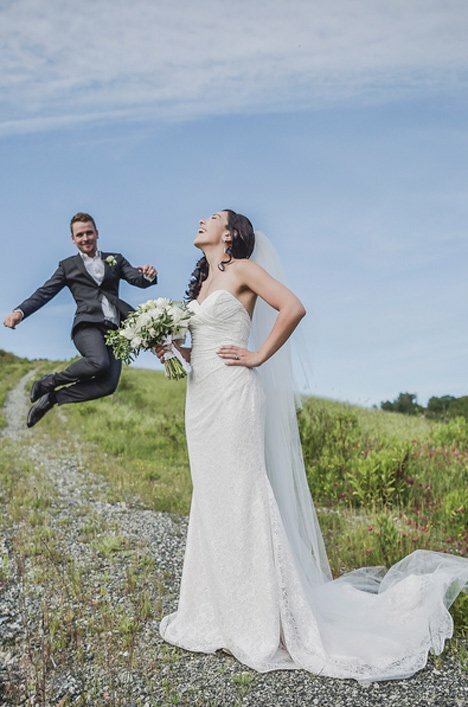 He had us running through fields and climbing up hills to capture these gorgeous moments. Nicholas and I spent more time caught up in each other eyes and smiles then focusing on the camera and it was these true moments that Andrea turned into a piece of art. Video was captured by the amazing team at Vertigo Videoproduzioni from Bientina, Italy, Nicola and Francesco produced a true piece of magic. From the subtle smiles to the goofy moments they captured it all. We had a great laugh at attempting to act normal with a camera in our faces and Nicola kept telling me “Don’t worry I am invisible”. We trusted their artistry immediately, as the dedication they showed to their work was outstanding. The final product was so much more then we could have asked for. We wanted a stress free day where we would not lose sight of our reason for being there and the love between us. All of our vendors made sure they brought smiles to our faces and allowed us to remain focused on each other. It was truly the most special day, looking back I will treasure the moments that were spent with our loved ones and the memories that Nicholas and I have together.